Having served as Chief of Surgery at UPMC Beacon Hospital from 2008 to 2014 Mr. Ó Ríordáin holds the posts of Consultant Colorectal Surgeon, Head of Colorectal Surgery and leads the Gastrointestinal Multidisciplinary Team at Beacon Hospital. 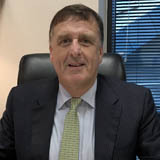 Mr. Ó Ríordáin is Consultant Surgeon at Tallaght University Hospital in Dublin and Naas Hospital since 2001. He is Lecturer in Surgery at Trinity College Dublin and Assistant Professor in Surgery at University College Dublin.